I’m very late to this party. Before there was Harry Potter (90’s), there was Redwall (80’s). Where was I? I thought perhaps I had read this long ago, as I had faint impressions of it, but on the advice of This Kid Erik, I decided to grab a copy and read it again. It was completely new to me. Then I found out a cartoon series has been done of this series. After looking it up, I’m pretty sure that’s where my obscure memories stem from. I must have seen an episode or two. So how’d I like the book? It was really cute and adventurous, though I wasn’t blown away by it. Probably as a kid I would have been. It’s the bigger than life kind of tale I would have treasured. Redwall is a monastery. The mice of Redwall are peaceful and practice good to all. But a monstrous rat, Cluny the Scourge, sets out to capture the abbey and claim it as his own. This is the epic battle between Cluny’s evil army of rats, stoats, and weasels against the loveable woodland creatures on the side of right. 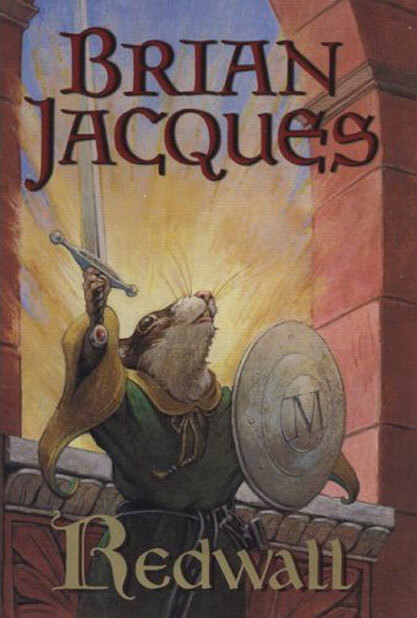 And at the center of the adventure, an old legend of the long-ago hero of Redwall blends with a brave young mouse who possesses the heart of a champion. The cast is comprised of all animals. Though the goings-on inside Redwall have a distinctly middle ages flavor—it feels almost historic, other than there are no humans. I’d judge the reading level to be approximately fifth grade, but I’d rate entirely appropriate for ages 8+ with one caveat. Keep in mind that the entire pretext is a battle, with weapons and death, villains and heroes. The violence is not gratuitous, and the animals give it a fairy tale flavor. It’s definitely a high stakes adventure. But not all the furry woodland animals make it to the end of the book, if that poses a problem for your young reader. Definitely an engaging tale. It’s no wonder it’s considered a classic by so many. Highly recommended. Have never read this series. It sounds like something young people would enjoy. I love that it is set in an abbey. Great review. Welcome back! Isn’t it great to be away from the computer. I’ve been giving myself a lot of breaks this summer, which has allowed me to review books that I wouldn’t normally review. It’s been fun. Hope you had a great vacation or time off. Thanks, Pat. Getting away is great, but coming back is a lot of work, lol! I did have a really great time with family and was able to proofread two great books by two great indie authors while I was gone. Since my library has all 20+ books in the series, I finally broke down and replaced my very worn copy of Redwall. Several years ago, it was a VERY popular series with my readers, to the extent that when Jacques died, I had to send half a dozen e mails home to parents so that THEY could break the news instead of me! Not my favorite, since I don’t like talking animals, but my daughters liked the tv series. Oh, thanks for that insider info on the kid response to Redwall, Ms. Yingling! I can see how Jacques’ death could be traumatic for child fans. Beloved stories (and their authors) really do become a part of us. I very much wish someone had directed me to this story when I was younger.